With many salaries above the national average and positions expanding rapidly, it’s an exciting time to consider a career in criminal justice. Educational programs offer students a broad knowledge base and prepare graduates for roles in the government and private sectors. For students with a passion for justice and hopes of working within a community to enact change, use this guide to explore the criminal justice field. Prospective students can learn about their educational options, browse top schools, and explore career opportunities and funding options. A law enforcement writer at , Paul Grattan, Jr. graduated from the FBI National Academy and holds a bachelor’s degree in Criminology from John Jay College of Criminal Justice. Paul began his career with the NYPD in 2001, where he served with patrol, the Street Narcotics unit, and the Community Policing unit. Promoted to sergeant in 2008, Paul led a plainclothes team that combated felony crime throughout the nation’s busiest metropolitan rail system. Paul is currently assigned to the NYPD’s Transit Bureau Headquarters, where he writes, researches, and proudly plays a part of a dynamic team. For prospective students pursuing a career in criminal justice it can be difficult to decide what schools offer the best degree programs. We’ve compiled the best schools offering criminal justice programs by analyzing a variety of factors such as cost, class size, and financial aid opportunities. 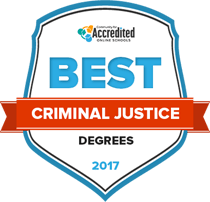 Explore the ranking below to find the best criminal justice degrees for 2017. Offered entirely online, Sinclair College’s criminal justice science programs give students the education and experience they need to land a position in their desired field. The two-year criminal justice program has different tracks that students can take. Each track shares some core curriculum to give students an understanding of criminal justice practices, both past and present. After, the tracks give specific instruction to students so they can learn more about their field of choice. The courses are also transferable to universities in case students want to pursue a four-year degree. Multiple fields of law enforcement and criminal justice are offered at Arkansas State University Beebe campus. Each of these programs is designed to help students enter the professional field after earning their two-year degree in criminal justice. Students also have the option to further their education after earning a two-year degree if they want to continue toward a different career path. Courses for criminal justice at Arkansas State University are offered either on their Beebe campus or entirely online, in case students need the flexibility to study when they are free. Kansas City Kansas Community College offers many different two-year degrees in criminal justice, each of which leads toward a career in a related field. The degrees can be used to transfer to a four-year institution, or they can be applied directly toward a career. The curriculum at Kansas City Kansas Community College combines technical criminal justice courses to give students a fundamental knowledge of criminal justice. After that, students will focus more on their desire field, giving them the chance to focus courses that are more applicable to their career goals. The curriculum for an associate degree in criminal justice at Hillsborough Community College gives students the essentials to succeed in their field. The program begins with a broad teaching of criminal justice, and it eventually develops into more specific courses that students are interested in learning about. An associate in criminal justice at Hillsborough Community College will give students the knowledge and experience to work in a career related to law. Credits can be transferred to a four-year institution if students wish to continue their educations as well, but the degree on its own gives students the knowledge they need. Pima Community College offers an associate degree in law enforcement that can be used to help students earn an entry-level position in their desired field. Law enforcement is an important part of criminal justice, so Pima Community College makes sure that students earn a thorough understanding of the field. After completing their degree, students will have more than enough knowledge and experience to enter their field of choice. Courses can also be taken online if students have to work around a full-time job or a family, or in person if students want direct instruction. The degree structure for an associate degree at Hill College is incredibly flexible, designed to meet the needs of the student. Because criminal justice is such a diverse field, an associate degree in criminal justice at Hill College can come in different forms. There are multiple specializations students can choose from, each of which is designed either to help students earn an entry-level position or continue their education at a four-year institution. Regardless of where students go with their degree, they will have both the theoretical and practical knowledge to make an impact in their field. The two-year program for a degree in criminal justice at Howard College offers students the flexibility to study the courses they are interested in. While there is a core curriculum that needs to be studied, students are also able to pick and choose the courses they want to give themselves more experience in their desired field. This is ideal for students that may want to continue their education by transferring to a four-year institution, or those that have a very specific career in mind that they want to work toward. Courses are offered online or in person on Howard College’s campus. Criminal justice is a growing field, and NorthWest Arkansas Community College has structured their curriculum to give students a broad understanding of criminal justice. This way, students can use their associate degree in criminal justice to enter almost any field that is related to the program. To make sure that students are learning what they are interested in, there are multiple tracks offered at NorthWest Arkansas Community College, each of which leads toward a specific career. Students should be prepared for an entry-level job by the time they complete their degree. The associate degree in criminal justice offered by Chemeketa Community College is meant to steer students toward a field in juvenile corrections. While completing their degree, students will also earn a certificate in juvenile corrections which may be needed for them to gain employment in their desired field. Courses at Chemeketa Community College are offered entirely online, so students don’t need to commute to campus at specific times each week. While the program is ideal for juvenile corrections, the material can be applied to any number of fields related to criminal justice. Oakland Community College understands that there are multiple directions students can take a degree in criminal justice. To help separate their graduates from others, Oakland Community College offers degrees in multiple fields, each of which is designed to either place students in a specific field or give them the general education they need to enter any field. Students can also get their credits transferred to a four-year institution if they desire, continuing their education. Even without transferring, any of Oakland Community College’s two-year criminal justice programs should provide students with the knowledge and experience they need. Students who study towards a bachelor’s degree in criminal justice at Saint Leo University have the option to take their education in whatever direction they’d like. After earning their degree, students will be prepared to enter a professional role. However, they will also gain ample knowledge to continue their studies and pursue a graduate degree in criminal justice. Saint Leo also offers the degree program entirely only, perfect for those with families or careers they are currently focused on. The curriculum teaches both technical and abstract lessons in criminal justice, giving students an all-around education. The CUNY John Jay College of Criminal Justice master’s program in criminal justice is meant to allow students to study what they want, when they want. One part of this is that all classes are offered entirely online, allowing students to continue their career while studying to advance it. Also, the program can be completed in a relatively short amount of time. If they want, students can still opt to study on-campus at John Jay College of Criminal Justice as well. This master’s program can go on to help students further their career or prepare them to continue their studies. To give students the best real-world education possible, Tiffin University employees professionals in criminal justice related fields to teach the courses. This way, students understand the theory and reality of the practice, best preparing them to enter a professional role after earning a bachelor’s degree in criminal justice. Tiffin also offers specific courses and focuses that allow students to spend more time studying the part of criminal justice they're most interested in. The program can be completed entirely online, and there are plenty of career paths that students can take with their bachelor’s degree in criminal justice. Some students don’t have the time to commute to campuses to complete their master’s degree. To help with this, the University of New Haven offers their master’s program in criminal justice entirely online. This is ideal for students that want to continue their education while also continuing their career. After earning a master’s degree from New Haven, students will have more experience and knowledge that they'll need to continue their career in a criminal justice related field. New Haven also has an extensive alumni network, something that could help students get better connected to the field they're interested in. No matter what stage of your career or education you’re currently in, Eastern Kentucky University has a degree program ideal for you. Offering both bachelor’s and master’s degrees in criminal justice, Eastern Kentucky University allows students to complete their education entirely online. Each degree has a specific focus on the field that the student is most interested in entering or advancing through, making sure that they have the knowledge necessary to further their profession. This makes Eastern Kentucky’s program ideal for anyone who is interested in furthering a career in criminal justice. To best prepare students for a professional career in a criminal justice related field, Lake Superior State University has designed their degree program to give both practical knowledge and real-world experience. Students pursuing a bachelor’s degree in criminal justice will learn through lectures while also bolstering their knowledge with hands-on practice. This will help give students an edge when competing to enter their field professionally. There are many different degree focuses in criminal justice offered, so students can take their education in any direction they'd like by studying a specific field. Utica College separates itself from other institutions by offering areas of study that might be more specific to student interest. Because criminal justice is a large field, Utica is offering a bachelor’s degree in criminal justice that deals with specifics rather than general studies. This gives students a chance to focus on their field and separate themselves from competitors who earned a general degree after graduation. The bachelor’s degree program in criminal justice can be completed entirely online, and students will receive the same quality education they would expect from an on-campus degree program. Graduates of Madonna University’s criminal justice program go on to enter any number of criminal justice related fields. While students will enter one of many diverse fields in criminal justice, they are educated to take on leadership roles. This is best for students who want to eventually become leaders in their field and want to further their career. Madonna University also connected students who earn a bachelor’s degree in criminal justice with professional roles, and students have the option to study in internships while pursuing their degree to make themselves stand out even more. Offered either on-campus or entirely online, Keiser University – Fort Lauderdale’s bachelor’s degree program in criminal justice is meant to give students a broad understanding of the field. This is best for students who are not yet sure what direction they want to take their degree professionally or those that will want to further their education with a master’s degree. No matter what direction students decide to go, they will have the knowledge and experience needed to succeed in their desired field, and they will be prepared to enter a professional role after earning their degree. Criminal justice is a rapidly changing field, especially due to the growth of technology and connectivity. Anna Maria College understands this and has constructed their curriculum to ensure that students can thrive in the modern world of criminal justice. To help with this, a master’s degree in criminal justice at Anna Maria College can be focused on a specific track, giving students the in-depth knowledge of the subject needed to earn a better career in the field. Students will also receive a fair amount of education on theory, ethics and diversity. This guide provides a comprehensive round up of resources that help criminal justice students succeed in school, find networking opportunities, and prepare for their future careers. Criminal justice students of all backgrounds and interests can use our scholarship database to search for funding opportunities that fit their needs. Students will find information on other financial aid options as well. From forensics to law enforcement to homeland security, this guide profiles the top criminal justice careers for graduates of all levels and academic disciplines. Learn about growth, salary, and job requirements for each career. This guide highlights programs that help veterans transition to civilian careers in criminal justice with resources for job searching, resume writing and taking advantage of transferable skills. Criminal justice programs vary as much as the individuals who choose them. Use our school search tool below to help narrow down your options. Whether seeking an online or on-campus program, a specific school size, or a certain price bracket, this tool provides students with a list of programs tailored to individual needs and preferences. Like many other professions, criminal justice careers may have varying salaries, licensing requirements or job functions depending on the state. In addition, it can be helpful to explore educational options in your state to find the right school and program for your needs. With educational and career opportunities ranging across specialties like law enforcement, forensics, homeland security and corrections, criminal justice students have flexibility when selecting their path. Students can earn a general criminal justice degree and then hone in their concentration once they enter the job market, or pursue a specialized degree in an area of concentration such as forensic psychology, counterterrorism or cybercrime. Increasingly, criminal justice employers are seeking candidates with some form of post-secondary education. This can include everything from police academy training to a doctorate in criminology. Regardless of the discipline or specific career path, it’s important for prospective criminal justice professionals to get the right education to learn the necessary skills and stay relevant in a competitive job market. Criminal justice is the system in place for dealing with criminal behaviors. Made up of a series of practices and laws, the system exists to monitor criminal behavior, catch individuals engaging in unlawful activities, provide a legal framework for establishing guilt or innocence, and offer a series of precedents on how to punish someone based on their actions. Within this framework, three primary institutions oversee the proceedings: law enforcement, courts, and correctional facilities. Graduates with degrees in criminal justice have many doors open to them – ranging from post-graduate study in public administration, emergency management, or law to careers in criminal justice research, security management, forensics, social work, and intelligence gathering. In 2015, the FBI’s Computer Analysis Response Team examined 9,770 terabytes of data during the course of 7,338 investigations. The annual cost of corrections in the United States is about $70 billion. The highest concentration of criminal investigators resides in Arizona, New Mexico, and Texas. As of 2014, there were 806,400 police and detectives working in the United States, according to the U.S. Bureau of Labor Statistics. There are 94 federal judicial districts spread throughout the country, and probation officers work in all of them. Which Criminal Justice Concentration is Right for You? Criminal justice is a dynamic, wide-ranging field and many choose to specialize their knowledge in a specific concentration. With options ranging from cyber crime and forensics to legal and corrections, prospective students can tailor their curriculum to future aspirations. Complete the following quiz to find out which concentration is best for you. If someone described you in one word, what would it be? Which of the following statement best describes your work style? Students are eligible to apply for entrance to an associate-level criminal justice program with a high school diploma or a GED. Students learn a variety of foundational topics, ranging from law enforcement and corrections to the courts systems and probationary policies. Students complete general education requirements and major-specific courses covering the same topics of an associate degree but in more depth. Students selecting a concentration must complete nine to 12 hours in that area. While internships may not be required, they can be valuable in securing a job after graduation. Covering topics ranging from victimology and terrorism to policing and cross-cultural issues, graduates are prepared for management and leadership roles. Applicants must hold a bachelor’s degree in criminal justice or a related field and have a certain GPA. Completion of a master’s program requires students to complete a thesis or pass a comprehensive exam. Focused on theory, policy, and research, individuals seeking a PhD in criminal justice often aspire to high-level government positions or university-level professorships. Applicants must hold at least a bachelor’s degree and submit a recent GRE score. Many programs require a residency and a dissertation for completion. Criminal justice programs are available online at every degree level from associate to doctorate. Although program structure varies by degree level and concentration, the majority are offered asynchronously with requirements for online discussions, projects and tests. Students pursuing a master’s or doctoral degree will be required to complete some type of field placement, residency, or internship. Students pursuing a degree in criminal justice have many funding opportunities available to them. The table below provides a look at the range of options, including four types that don’t have to be paid back. Whether a general award or specific to the study of criminal justice, scholarships are most frequently awarded based on merit or financial need. Amounts vary greatly, but students can be awarded multiple scholarships to cover tuition. Most similar to scholarships, grants do not have to be repaid. They are most often awarded based on financial need through government bodies or private foundations. The amounts vary, and can be combined with other sources of funding to pay for school. Available through federal financial aid and private lenders, loans allow students to borrow money for school and repay it with interest. Federal student loans do not have to be repaid until after school, come with fixed interest rates, and offer numerous repayment plans. Typically available at the graduate level, fellowships often cover tuition costs and allow students to engage in advanced study or initiative development. Fellowships can range from a few months to the entire program length. Available through federal financial aid, work-study allows students to work at their academic institution or a local organization, and funds can either be used toward tuition or for everyday living expenses. Work-study is based on financial need. What should students look for in a truly exceptional criminal justice education program? The best criminal justice programs provide quality job placement resources and opportunities for internships, externships, and research work. Institutions with programs in forensic psychology, criminology, security management, social work, or communications in addition to their criminal justice programs tend to offer students a wider variety of elective courses to choose from, and these will help round out degree programs. It’s also critical to look at the backgrounds of instructors in the programs. Top schools have professors with experience in the military, local or federal law enforcement, and private security firms. What do you see as the future for the field of criminal justice? The criminal justice field looks excellent for the foreseeable future. Entry-level government careers in policing increasingly require degrees, and those with criminal justice degrees will naturally be favored. As public safety and security continue to be paramount, government investment in policing and counterterrorism will continue to be a priority. Likewise, the private security sector continues to grow, as companies and their clients see the need to invest heavily in systems security, access control, forensic investigations, and employee background screening. Schools are also beginning to demonstrate that they see the field advancing - by putting resources into more specialized courses that examine areas like cyber-crime, counterterrorism, and advanced legal studies. My education provided an outstanding base for a career in policing. Law enforcement offers much opportunity for advancement into a supervisory or investigative track. I now enjoy my work as a front-line supervisor and can assure students there is no shortage of quality options available to them. Policing is a great choice, and helping others is incredibly rewarding. Police work varies from day to day, and those in the field can move from patrol work, investigations, administration, training, and many other parts of the police organization. I enjoy this aspect of policing the most, and would encourage others to consider work in the criminal justice field for the very same reason.